BELLEVILLE, NJ, April 12, 2012, Former Actor David S. Katz has been recognized by Elite American Artists for dedication, achievements, and leadership in acting. Mr. Katz has spent more than 50 years in show business, and he has refined talents in stage acting. Mr. Katz has acted in films, on television, and in commercials prior to his retirement, and he feels that he has been able to rise to success because of sheer perseverance and his commitment to attending as many auditions as possible and landing one in three jobs. Over the course of a successful career, Mr. Katz also grew capable of handling rejection, which is considered to be a major strength when looking to progress as an actor. Mr. Katz was inspired by a long-standing love of the screen to follow his dreams of acting. In following his childhood aspirations, he received a Bachelor’s degree in Speech and Drama from Syracuse University, and became a member of the Screen Actors Guild. He was also inducted into Mensa International. Mr. Katz retired nine years ago after a 50-year career acting on stage. In his retirement, Mr. Katz enjoys going to the movies and theater, reading, and participating in fantasy sports. David Katz was originally selected for inclusion in EliteAMERICAN Artists in April 2012. 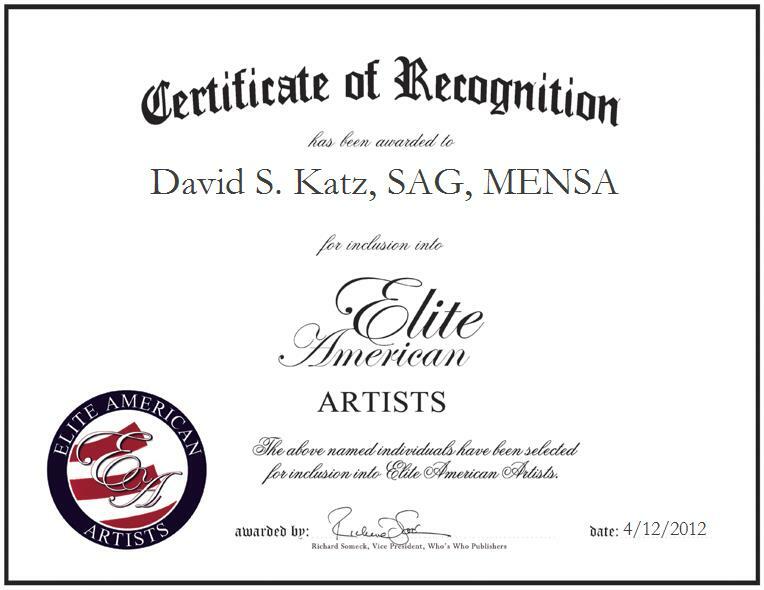 We are proud to be featuring Mr. Katz again in EliteAMERICAN Artists for 2015.